Delivering the Value, Honesty and Service You Expect! Are you looking for an experienced, and professional Arvada Electrician who treats your home with respect? An electrician who values your time and makes safety a priority? Meet ElectriCall – Arvada’s most preferred electrician for your home or business needs. You deserve to receive the quality service you expect, and at ElectriCall, our number one goal is your complete satisfaction. Call us today at 720-879-2253 for first-class electrical solutions. Since 2011, ElectriCall has been proud to serve the residents and businesses of Arvada Colorado. From day one we have been committed to delivering superior service with all of our electrical work. Because we are not a large electrical company / corporation with 25 – 100 trucks, and all of our electrical work is overseen by the owner Nigel himself, we are able to provide the personal touch the BIG guys can’t. Just like the BIG guys, we guarantee everything we do 100% (call with questions about our guarantee), and we work hard to ensure you are extremely satisfied with the electrical service we provide! So we are always on time and are reliable – we will be there when we say we will be there and do exactly what we say we will do. We treat your home and project with respect – We cover our feet when we come in your home. We clean up after ourselves, we don’t start punching huge gaping holes in walls or drilling holes in floors without thinking about it and planning it out with you; we measure three times and cut once. We are courteous and respectful. We buy only the best parts with the best warranties – we guarantee our service, so why shouldn’t we use electrical products that are made to last as well? We aren’t prudes about it. If you force us to install inferior products we will, but unlike others, we don’t pass them off on you and let you assume they are premium. We won’t send apprentices to your job and try to pass them off as master electricians – How do you know the people coming to your door are professional Arvada residential electricians? Don’t get us wrong, we believe the BIG guys send out safe, background checked workers to your home. But how do you know they have the electrical experience they need to do your job right and how do you know they care enough about what they are doing to be personally committed to making sure it’s done right? 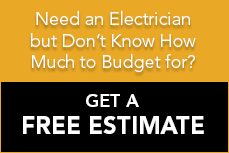 At ElectriCall, all of our Electricians are Master Electricians who care about their work and are personally invested in making sure you are 100% satisfied with your electrical services. We won’t take advantage of you – let’s face it. The BIG guys do a lot of advertising. That’s expensive. They need to optimize every service call to get the most money they possibly can out of it because they have investors and KPI’s and spreadsheets. If you call them, how do you know you need your panel replaced? How do you know you need all the electrical work and electrical products that turned your small job into a big job? If you are using a BIG services electric guy, you just might. We would never treat a customer like that. We see you as friends and neighbors that need help, not as meal tickets. We know that if we treat people honestly, with the respect they deserve, they will call us again and refer their friends and neighbors. That’s the best form of advertising! Besides, we’d rather charge a fair price and have clients that love us than overcharge, under serve and leave them unsatisfied. If you are tired of struggling with a recurring Arvada electrical problem, get help now – just call ElectriCall. Whether the electrical is Residential, or you need a Commercial electrician in Arvada, we can solve it quickly and efficiently. We aim to deliver world class customer service and the best value you can get for your home electrical or business. We understand that completing your project is just one of the many things you have on your plate, and you need someone to handle it professionally and efficiently. When you work with us, your job will get done on time, and on budget – your satisfaction is absolutely guaranteed. But don’t just take our word for it. See what your neighbors are saying about our services. We are your local Arvada electrician who is dedicated to your complete satisfaction. Contact us now and learn why so many of your neighbors prefer to work with ElectriCall! HAVE QUESTIONS ABOUT AN ELECTRICAL ISSUE? We are a team of highly skilled electricians who focus on providing superior customer service to homeowners, contractors and business owners across the Denver Metro area.